In the Middle Ages, the shrine of Our Lady at Walsingham was second only to the Shrine of St Thomas of Canterbury in its significance to English pilgrims. The statue of the Blessed Virgin and child was contained within a holy house, supposed to be a replica of the building in Nazareth where Mary had received the news of her pregnancy from the Angel Gabriel. It was said that the angel had appeared to Richeldis, a noblewoman, in a dream, and asked her to construct the building. 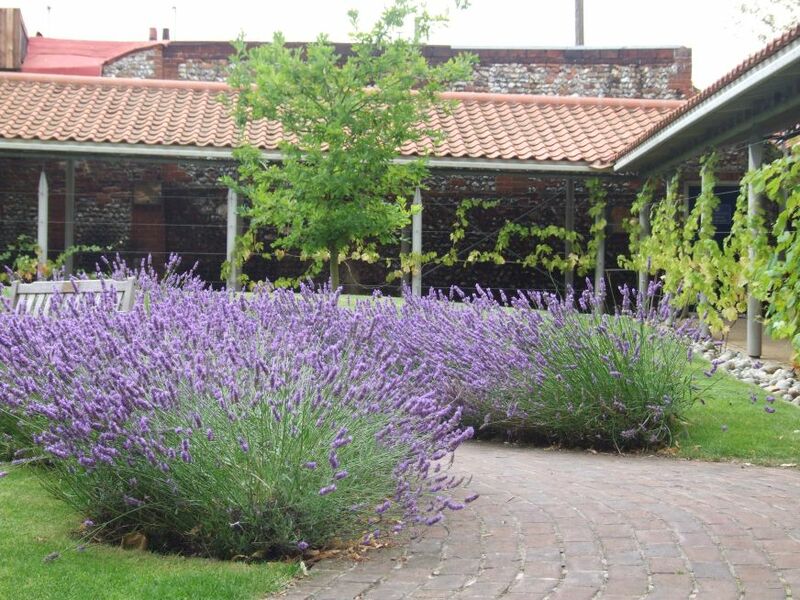 By the 12th century, a Priory had grown up here at Walsingham, and pilgrims, unable to visit the real Nazareth in the Holy Land because of its conversion to Islam, came to England's Nazareth instead. It was not to last. Pilgrimage, and the means of Grace which it sought to effect, were heavily frowned upon by the Anglican reformers of the 16th century. Also, the Crown had its beady eye on the wealth of pilgrimage sites, and so in the 1530s they were abolished by royal decree, their communities dispersed, their furnishings burnt or sold, their money accruing to the Crown. The statue of Our Lady of Walsingham was burnt at Chelsea, although at least one other statue, that of Our Lady of Ipswich, appears to have gone abroad, and is now at Nettuno in Italy. A heavy silence then descended on Walsingham. It was not difficult for such a remote place to become a backwater, and 16th century recusants, along with antiquarians of the 17th and 18th centuries, bemoaned its desolation. 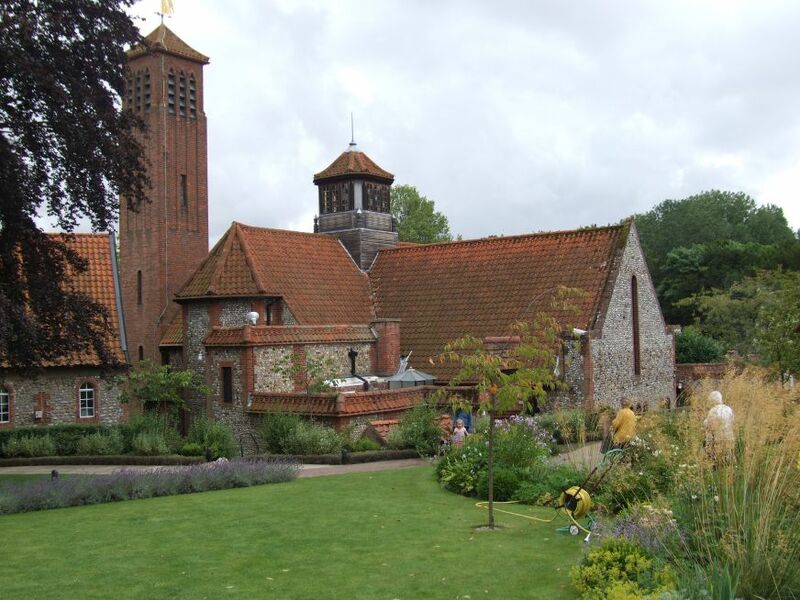 The story of Walsingham begins again with the decriminalisation of Catholicism in the 1820s. This had a two-pronged effect. Firstly, a group of Anglican intellectuals at Oxford were appalled by the possibility that the Church of England might become nothing more than a protestant sect, and sought to proclaim what they saw as the true Catholicity of a National Church. Secondly, the rapid emergence of Catholic communities in England led to the re-establishment, in 1851, of the Catholic heirarchy. For the first time since the Reformation, England had Catholic parishes again. It has to be said that neither of these two movements had much of an effect on Walsingham. There were few ripples to be noticed in this backwater of 19th century England. It was not until the 1890s that a Priest at the Kings Lynn church of the Annunciation, the Catholic parish into which Walsingham fell, built a Marian shrine within the Kings Lynn church, dedicating it as the Shrine of Our Lady of Walsingham. That same decade, Charlotte Pearson Boyd, a convert to Catholicism, gave the slipper chapel at Houghton St Giles to the Diocese of Northampton for Catholic use. This is now the heart of the Catholic National Shrine of Our Lady, but in the 1890s the Bishop of Northampton seems to have been a little embarrassed by it, and the statue remained at Kings Lynn. All this was happening in the background, then, when the main Anglican player entered on to the stage, a man whose name will be forever associated with the story of Walsingham. Alfred Hope Patten was a convinced anglo-Catholic, bringing the energy of the movement to a place in which the Faith was not exactly dead, but where it was certainly sleeping. 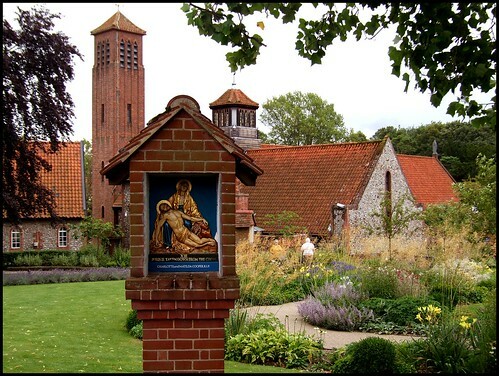 In 1921, he installed a replica image of Our Lady of Walsingham in Little Walsingham Anglican Parish church. At this distance, it is hard to realise what a provocative, radical act this was. The Church of England was at the apex of its cultural influence; thanks largely to the way in which it had ministered the experience and the grief of the First World War, it had a central place in the English imagination. The Anglo-Catholic Movement was in its ascendance, at the peak of its enthusiasm. Anglo-Catholics seemed to challenge the Anglican consensus at every turn. They would shortly attempt to have the Church of England replace its totemic Book of Common Prayer, in use for some 350 years, with a new prayer book. This would fail, and in retrospect the Anglo-Catholic tide began to recede at that moment. But that was all in the future. The Anglican Bishop of Norwich was outraged by Hope Patten's statue, and demanded that it be removed. Hope Patten carried out this request in considerable style, translating the image to a new location on the other side of the Priory ruins, and building another replica of the holy house of Nazareth around it, just as had happened some 750 years previously. Hope Patten believed that the pendulum of the Church of England was swinging his way, and that the views of the Bishop would one day come to be seen as of a past age. There were enough militant Anglo-catholics in positions of influence to ensure that Walsingham had powerful friends. The new shrine soon began to generate interest, and it was not long before it became necessary to build a larger church around the shrine, which was completed shortly before the outbreak of World War II. This was substantially extended in the 1960s, giving the building the shape and appearance it has today. It has to be said that the 1930s was not a good time to be building a new church or extending it. The exterior has a rather unfortunate municipal appearance on the outside, rather out of sorts with the beauty and splendour to be found within. The main entrance is obstensibly from the west, but in fact the 1960s extension has lovely arcading which opens onto the shrine gardens, which form a kind of plaza onto the north side of the building. At the west end of the church there are steps down into the holy well, supposedly discovered after Hope Patten paused in prayer above it. There is a large, beautiful enamel relief of the Annunciation here. Behind this is the holy house itself, lit up inside by hundreds of candles which burn here daily for Anglo-catholic parishes and intentions from around the world. The grand altar is surmounted by the splendidly dressed replica of the original Walsingham statue, glittering in its finery. In the arcades around the holy house are memorials of militant Anglo-catholic priests of the 19th century, from the time before their extraordinary movement reached out and touched this place. It is all a world away from the simplicity of the Catholic shrine. Beyond the holy house, the shrine church opens up and extends into a labyrinth of chapels on two levels. There are fifteen of these, allowing the rosary to be said, a mystery in each chapel. One of the chapels is dedicated and consecrated for Orthodox worship. Others are altars for particular Saints or causes. Which ever way you go, you eventually end up in the Blessed Sacrament chapel with its ceiling mosaic of the Coronation of the Blessed Virgin, above the high altar. It is a delight to explore, especially if you can do so with a sense of detachment. I am not an Anglican myself, but I know that some Anglicans, including those with Anglo-catholic sympathies, are not entirely comfortable here. These days, the focus of pilgrimage to Walsingham has tended to shift towards the Catholic shrine at Houghton St Giles, which receives thousands of pilgrims a day in season. In contrast, the extreme end of the Anglo-catholic movement is shrinking; the tide has receded, and the Faithful have become somewhat beleaguered. The shrine never made it to the heart of Anglicanism in the way that Hope Patten had envisaged. 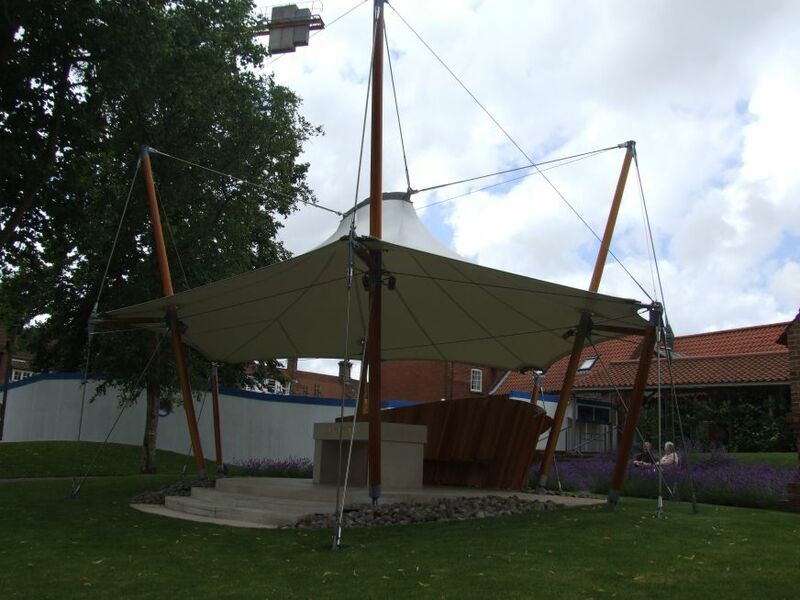 But in another way, the shrine has reinvented itself, along with the mainstream of the Church of England, to stand as a witness to the Faith for the hoards of tourists and visitors who make their way to Walsingham. They come here with their hunger for the spiritual, their God-shaped holes, and enter a sense of the numinous which has a like nowhere else in England. God moves in mysterious ways.